Have you seen our Pinterest account? No? Then what are you waiting for! Check it out here. 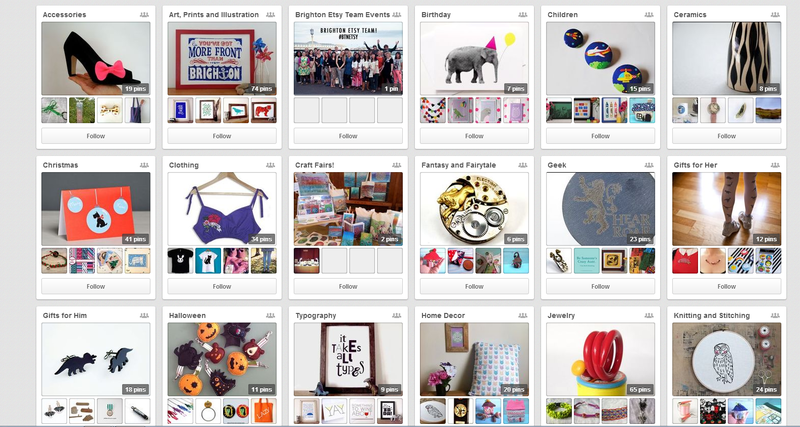 Our Pinterest is a great way to browse everything that Brighton Etsy Team sells as a whole. I see it as a big shop window where you can easily see everyone’s items on sale at once! Everything is organised into categories or theme – including Halloween and Christmas. Start shopping for gifts now! All the items on there are sold locally by Brighton Etsy sellers, so it really helps support us. It’s not a comprehensive list, but it’s growing all the time and is a great way to browse everything our makers sell. The best bit? Pins link straight to their listing and so you can buy them, or find out more about the shop and what other wonders they sell. Try to pin only shops or items that are other members of Brighton Etsy Team (BET) to the Brighton Etsy Team boards. This means that people browsing the boards who are potential customers are seeing the best bits of Brighton Etsy team. Feel free to share any BET items on OTHER pinterest boards – this will help spread the love far and wide! Feel free to pin your own items! That’s what the boards are there for. To start Pinning you’ll need to be invited first. Contact me with a link to your Pinterest account/page and I’ll invite you to the boards.